Sarajevo, 22 October 2016 – The Employees and Activists of the National Museum of Bosnia and Herzegovina received a Grand Prix of the EU Prize for Cultural Heritage / Europa Nostra Award 2016 at a festive event held yesterday at the Museum. 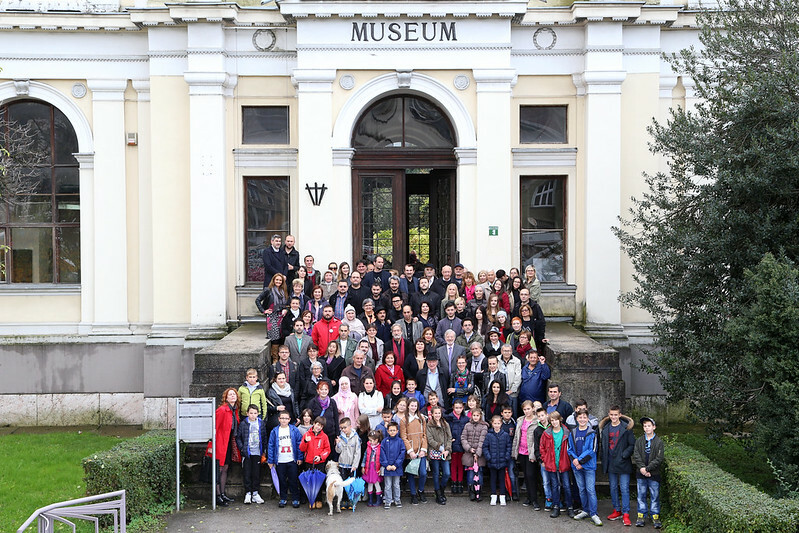 Some 300 people, including dozens of activists who took part in the campaign ‘I am the Museum’ conducted by the NGO Akcija Sarajevo, gathered to celebrate this exceptional heritage achievement for the country. High-level representatives from Europa Nostra, Europe’s leading heritage organisation, the Delegation of the European Union in Bosnia and Herzegovina, the Museum and NGO Akcija addressed the audience. Each ceremony attendee had the opportunity to have an individual photo taken with the Award trophy. This memorable event was enhanced by a short performance given by the renowned Spanish musician Maestro Jordi Savall and his ensemble Hespèrion XXI as a special musical tribute to the Employees and Activists of the Museum. This great celebratory day ended with an exceptional concert of traditional musical heritage from the Balkans performed by Maestro Savall and his ensemble at the Town Hall of Sarajevo, an iconic heritage building which, after having been victim of war, was reconstructed and re-opened in May 2014. John Sell, Executive Vice-President of Europa Nostra, added: “You have resisted and for the moment the Museum is safe. But resistance is only the first step. The energy of all those involved in this campaign can be used to revolutionise the future of the museum. You have made a start by using the Grand Prix of the EU Prize for Cultural Heritage / Europa Nostra Award worth €10,000 for a 3-D visualisation of the Museum. But I urge you to see that as just a small start in exploring how this museum can genuinely play a part in the lives of everyone in this country. You have taught the rest of Europe a lesson in resistance. Now look outside and see all the exciting and adventurous things museums are doing in the rest of Europe. Then we can all truly say ‘I am the Museum’. Lars-Gunnar Wigemark, Head of the Delegation of the European Union in Bosnia and Herzegovina also gave a short speech, stressing the willingness of the European Union to help ensure a better future for the Museum and calling upon the public authorities in Bosnia and Herzegovina to give higher priority and stronger support to the Museum and other cultural (heritage) institutions in the country. Mirsad Sijarić, Director of the National Museum of Bosnia and Herzegovina, and Aida Kalender, Programme Director of NGO Akcija, expressed their deep appreciation to the representatives from Europa Nostra and the European Union for their important recognition as well as to all the citizens who participated in the campaign ‘I am the Museum’. While introducing the short performance at the Museum, Maestro Jordi Savall, who has dedicated his entire life to promoting dialogue and understanding between various cultures and religions through the enjoyment of our shared musical heritage, praised the remarkable accomplishment of the Employees and Activists of the National Museum of Bosnia and Herzegovina. He also stressed the importance of caring for our shared heritage as a vital component of our collective memory. During the ceremony, the attendees visited the photo exhibition “Guardians of the Museum” featuring portraits of the employees made by the photographer Zijah Gafić during the period when the Museum was closed. In the evening, Maestro Savall and his ensemble Hespèrion XXI, composed of outstanding musicians from various countries of the Balkans and South-East Europe, gave a major concert at the Town Hall of Sarajevo. Their concert of traditional Balkan music played on traditional musical instruments by outstanding musicians coming from different countries of Central and Eastern Europe, was a moving end to a great celebratory day in Sarajevo. This exceptional concert was organised with the support of the European Union (through its Creative Europe programme) and the Regional Cooperation Council (RCC), and thanks to the personal commitment and generosity of Maestro Savall who wanted – through this concert – to contribute to the promotion of intercultural dialogue and our common cultural heritage – not only in Bosnia and Herzegovina, but in the wider Balkan region. The concert also received the support of the Jordi Savall’s International Ancient Music Centre Foundation (CIMA) based in Barcelona, the European Cultural Foundation based in Amsterdam and the City of Sarajevo.